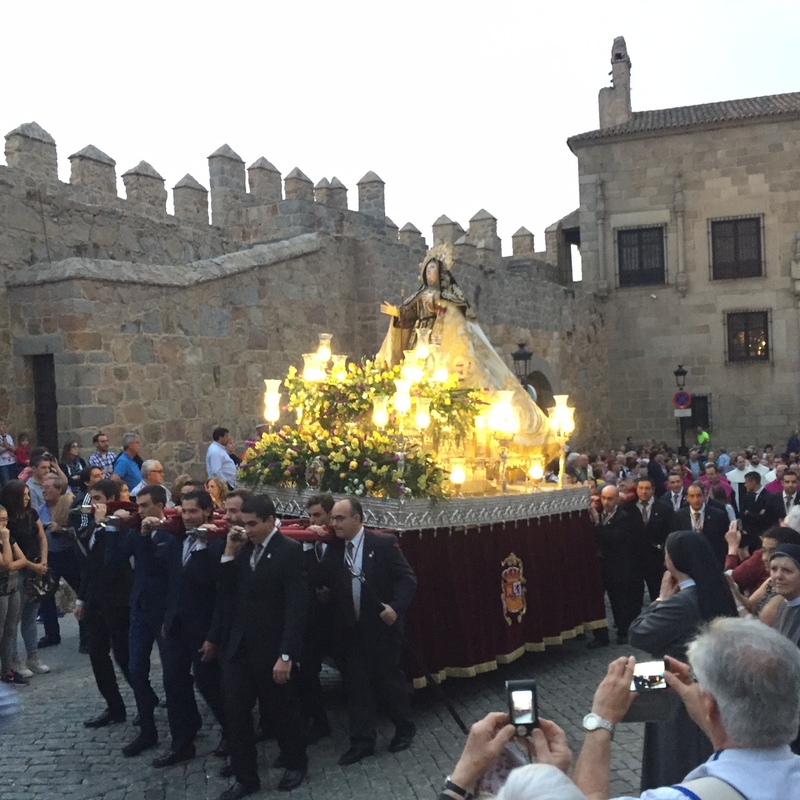 We continued our pilgrimage within a pilgrimage as we traveled to Avila to celebrate the feast of St. Teresa – one of Sonia’s favorites. We left by train early in the morning and arrived in Avila about 1pm. The train ride took us over the rugged mountains of northern Spain in the early dawn light and deposited us in the dry plains of the central part of the country. The flat arid terrain was a dramatic departure from the lush green we experienced along the coast. 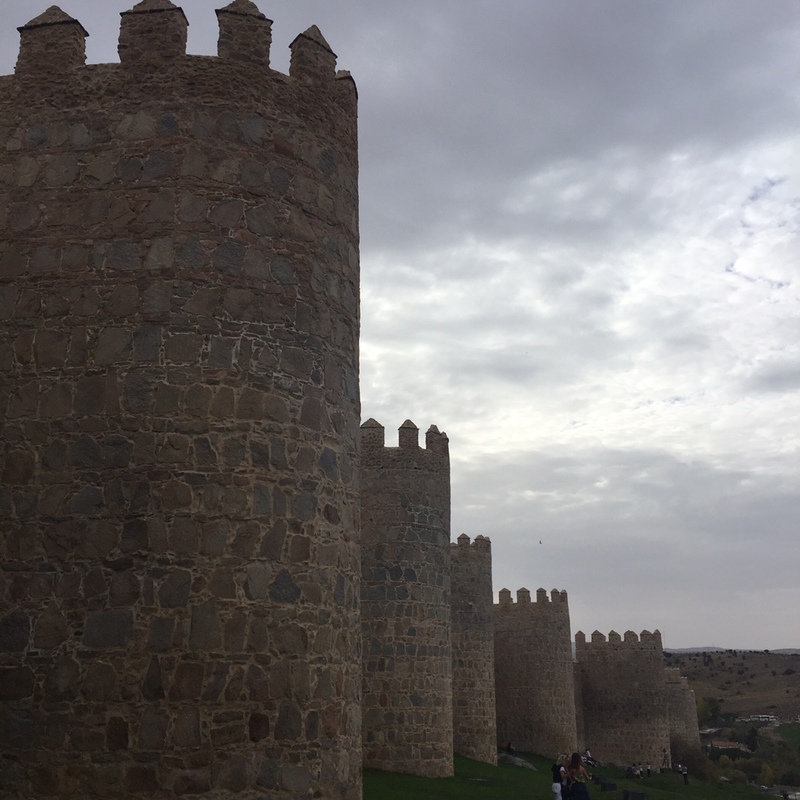 Our first view of Avila was of of the fortress like wall that surrounds the old city. The 10 foot thick walls have been well preserved/repaired and are a UNESCO world heritage site. A quick walk from the train station brought us to the 16th Century cathedral. 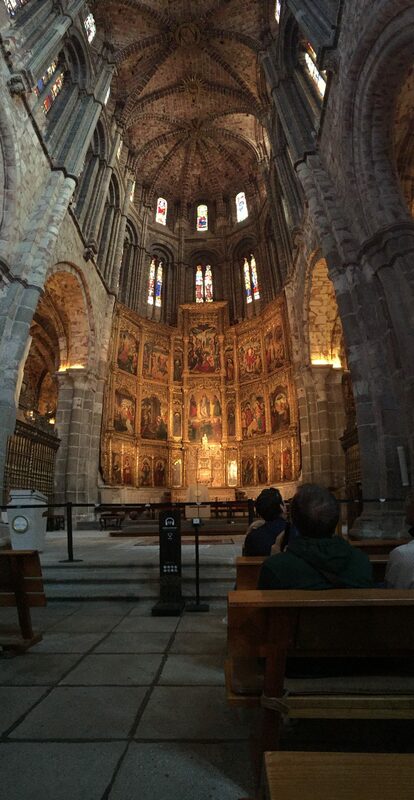 Much of the interior appears as it would have for Teresa nearly 500 years ago. I was moved by the pieta where she supposedly prayed after her month died when Teresa was 12 years old. In preparing for our visit I read “Interior Castle” and her autobiography. It was fun to imagine her in these same places, being shaped by the same God we know today. In her autobiography she recounts running away from home to become a martyr with her brother, only to be captured just outside the city gates by her uncle. We walked through the gate nearest her childhood home where she likely escaped into the rolling fields below the town. We returned quickly of our own accord. We visited the monastery where she was sent at age 15 and eventually reformed after more than three decades within its walls. The cell where she lived as prioress was on display along with the log she used as a pillow and the key to another cell where she lived for 27 years (presumably without ever loosing the key). We imagined her walking the stairs and hallways where we walked today. Later in the day we joined the festivities celebrating her feast day. Vespers were sung at the church near her birthplace followed by a procession led by the likeness of the saint, surrounded by flowers and lights, carried on a silver bier through town to the cathedral. It was similar to saintly processions held by some Catholic churches in the United States today – only more grandiose. The stories in her books were brought to life by the places we visited making her more real and the tales more meaningful. I may join Sonia in the Teresa fan club. Getting to Avila was not completely without incident. We had to change trains in Valladolid and had a nine minute window to make our connection. Our first train was inexplicably 30 minutes late. We brought our tickets into the station to change to the next train. We were met with utter disgust as we presented our tickets for the train that left 20 minutes earlier. After some huffing and puffing? Multiple signatures and forcefully applied stamps we had tickets on the next train that was leaving in an hour.